Are Your Students Prepared To Work in a Smart Factory? Where Are All the Highly-Skilled Workers? Could Automation Revive Manufacturing Apprenticeships? Amatrol Tours Available for SkillsUSA Visitors! Amatrol's eLearning on Kindle Fire tablets! Amatrol eLearning and LMS now compatible on Windows tablets! Join Amatrol for Manufacturing Day on October 3rd, 2014! Walla Walla CC wins The Aspen Prize, cites Amatrol as "paramount equipment"
Amatrol proudly introduces our new line of eBooks! Amatrol Celebrates Being a Top "Company to Watch"
Posted by Kenny Colston | March 27, 2018 |Amatrol, Inc.
It’s amazing that you can create a class that teaches the skills desperately needed by Industry and then, to your dismay, you struggle to enroll students. Here are five ways that may help you fill those seats. 1 – Put the cool stuff in the windows facing the hallways. One way to get students interested in your program is to feature the “cool” stuff front and center. Career and technical education (CTE) has evolved greatly from the old days of “shop class” that you may have taken in high school. 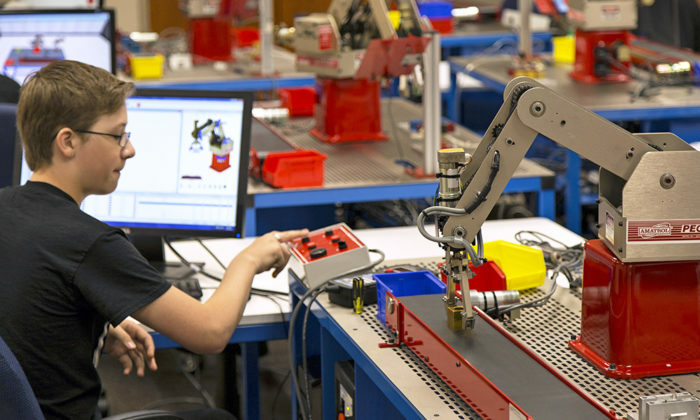 Now, students program robots and mechatronics systems, design and set up fluid power systems, and more. You need to showcase these systems to potential students. If you have windows that allow your classroom to be seen from a hallway, put your most interesting learning system, such as a robot, in front of them. If you don’t have a window, place a system where it can be seen through the doorway. Give students a reason to talk about your class. Promote tours to showcase the technology you are teaching. Create a buzz around your program with the younger students by inviting 8th graders to visit your classroom or by taking a robot to their school. As an extra incentive, have your current students perform the demonstrations. Watching older students interact with technology is a great way to excite this next generation of high school students. Also, schedule tours for parents. Parents have a misconception that the advanced manufacturing world is a dead-end career path and it is essential to correct that viewpoint. There are several ways to demonstrate that Career and Technical Education can provide high-paying and rewarding jobs. A quick search on the job websites, such as “Indeed,” “CareerBuilder” or “Monster” will provide a list of skilled manufacturing jobs, such as production technician, industrial maintenance technician, electrician, etc. You can show how those jobs are in demand and require the skills that you are teaching. Contact those companies and arrange for speakers to come and talk about Industry’s employment needs and the opportunities for highly skilled individuals. 3 – Give your room some POP. Manufacturing is no longer a dark and dingy place to work and your classroom should not be either. Repaint the walls! Add some banners! Sometimes, all you need to gain attention is to show that things are changing in your classroom. If you can paint, then mix up the colors every few years. If you can’t paint, try updating your signage. Students (and their families) need to see the technology showcased in the best way possible to feel like your class adds value to their future. If you have former students that have successful careers after taking your class, feature them by displaying certifications or logos from companies that have hired them. 4 – Recruit in non-traditional places. Set up a booth at your school’s sporting events, local festivals, and local church events to show the community the incredible opportunity available for students. Enticing students and parents into your classroom is a tough sell, so you need to go to them. Once they see the well-paying job opportunities in modern manufacturing, student recruitment will become easier. 5 – Train guidance counselors how to present your program! This may be the most important way to increase your enrollment. You can’t expect guidance counselors to understand what you are offering students unless you bring them in and walk them through it. Otherwise, be prepared to hear your class being referred to as “shop class.” Counselors need the correct terminology, available job information, and expected wages so that they can create an accurate narrative for prospective students. If you aren’t on the same page, it’s going to be that much harder to get students into your program. Kenny Colston is the Social Media Specialist for Amatrol, Inc. Learn more about Amatrol and its technical training solutions, including eLearning, here and connect with Kenny on Amatrol’s Twitter, Facebook, Google+, YouTube and LinkedIn pages.